At the Retis laboratory of Scuola Superiore Sant'Anna, a steel ball was maintained at the centre of a metallic plate using FLEX board. March 2010: The complete ready-to-use system named as "Amazing Ball", as seen in demo video below is now commercially available. An article (in Italian) titled "Equilibrio (quasi) perpetuo" features on the Italian Focus monthly magazine. Check the download section below. 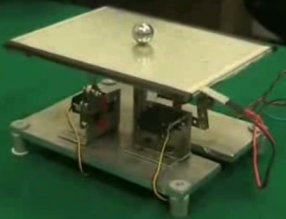 A steel ball was continiously balanced and maintained, preventing it from rolling over or falling down from the centre of a vibrating metallic plate using FLEX board with two servomoters. A touchscreen was used to take the position of the steel ball. Article titled "Equilibrio (quasi) perpetuo".